A collaborative investigation launched by law clinics at four top universities has assembled damning evidence of widespread misconduct. An investigation undertaken by law clinics at NYU, Fordham, Harvard, and Stanford has concluded, after eight months of study, that the NYPD abused Occupy Wall Street protesters and violated their rights on numerous occasions during the 2011 protests that radiated out from Zuccotti Park. Their report, Suppressing Protest: Human Rights Violations in the U.S. Response to Occupy Wall Street, was released today. It focuses on transgressions against international law. What I found most arresting were its specific descriptions of alleged police misconduct. Scores of examples were offered. I’ve highlighted a selection of the ones that struck me as most credible, whether due to video footage of the incident or eyewitness testimony from a credentialed journalist, a designated legal observer, or a member of the legal team that put together the report (the report, linked above features links). Video shows that an officer drove a scooter at a crowd of people, including journalists and legal observers. The video then shows a legal observer lying on the ground screaming, his foot under the scooter. A second video shows the observer on the ground with his foot under the scooter. A third video shows that the observer kicked the scooter off or away from his leg, at which point officers dragged the observer several feet and began to cuff him. While he was being cuffed, an officer pushed the observer’s face into the pavement by pressing his baton across the back of the observer’s neck. A member of the Research Team observed an officer push and then throw a male protester into the air for no apparent reason as he walked, with many other protesters, near parked police scooters. The protester fell hard to the ground and was not arrested. Video shows that an officer approached a woman from behind and grabbed her by the strap of her backpack and her scarf for no apparent reason. The officer began to pull the woman towards him, and other protesters began pulling the woman away from him. The officer pulled at the woman by the strap of her backpack for approximately fifteen seconds, and appeared to possibly be choking her via the strap or her scarf. The protesters eventually pulled the woman away from the officer, and police appeared not to take any further action. Video shows that an officer punched a protester three times in the head and shoulder. At the time, the protester was in a soft lock, in which he linked arms with other protesters and sat in the street, and police were attempting to pull him away. The video shows that the officer tried to separate the protester several times by pulling him, but did not attempt any other methods before punching the protester. Video appears to show that police pushed a woman onto the hood of a car. The woman then fell to the ground and did not get up for several seconds. When she got up, the woman was holding a microphone; the video’s caption states that the woman is a “news reporter.” A news report provides a video of the same incident from another angle and identifies the individual who was pushed as a reporter for the Daily Caller. Lawyers representing a legal observer stated that eight officers “charged toward the legal observer, forcing his upper body onto the hood of a parked car, where they roughly grabbed his arms and forced them high behind his back …” Before the incident, the legal observer had been recording the names of arrestees as they were led to a police van. At the time when he was arrested, the legal observer was speaking on his cell phone. The district attorney declined to prosecute the legal observer (who had been charged with disorderly conduct). Video confirms that the legal observer was speaking on the phone when an officer approached him. The legal observer walked toward the sidewalk, but the officer grabbed him and pushed him onto the hood of a parked car. Three other officers then came over and helped the officer cuff the legal observer. 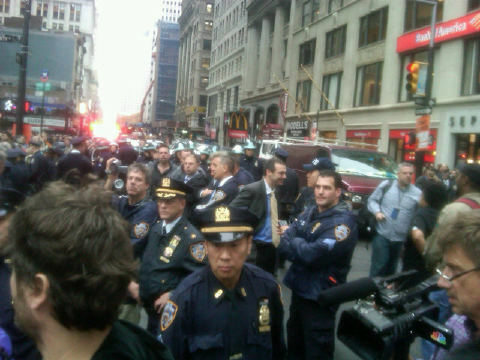 At one point, eight officers surrounded the legal observer. A member of the Research Team witnessed a particularly violent arrest. A protester was observed lying on the ground, with a number of officers standing near. The protester stated that his shoulder had just been dislocated; the officers stated that they had called an ambulance, and were not going to handcuff the protester because of his injury. However, moments later, a second group of officers rushed in and aggressively handcuffed the protester. He screamed out in pain repeatedly and told the officers about his injury, asking them to be gentle. The officers responded by stating the he was “a liar,” and they repeatedly intentionally pushed and pulled his injured shoulder. When EMTs did subsequently arrive, they inspected his shoulder, immediately removed the handcuffs, and put him in an ambulance for treatment. The individual’s lawyer later stated that the protester in fact had suffered a broken clavicle, an extremely painful and serious injury. A member of the Research Team witnessed officers arresting a protester. A number of officers took the protester to the ground, and restrained him as he lay face-first on the street. The Research Team member heard the protester cry out, and knelt down to observe the arrest. She then witnessed an officer pull back his leg and kick the protester hard in the face. Another witness also saw the incident. Efforts to obtain the badge number of the responsible officer were thwarted by police, who refused to identify the officer and then took him away in a police van. Karen Smith, a retired New York Supreme Court judge, was working as a legal observer during the eviction of Zuccotti Park. She allegedly witnessed an officer throw a woman to the ground “out of nowhere” and hit her in the head. Smith stated that she then told the officer, “cuff her if she’s done something, but you don’t need to do that.” The officer then, Smith said, asked her if she wanted to get arrested, at which point she stated that she was a legal observer. The officer again asked if she wanted to “get arrested,” and pushed Smith up against a wall. The report concludes that “In U.S. cities with significant abuse allegations and no major reviews of police practice, including New York City, independent official reviews are urgently needed to assess past practice ….” It’s difficult to disagree with that conclusion, especially given all the video footage available to adjudicate some of the incidents at issue. More detailed reports about police misconduct during Occupy protests in other cities are on the way. Stay tuned.